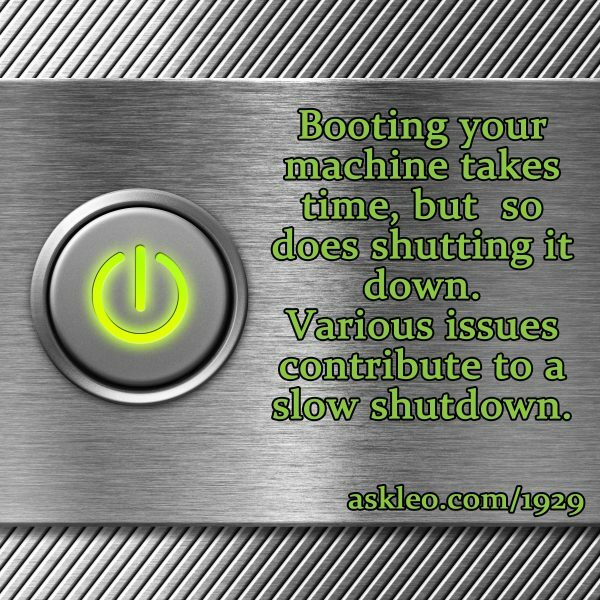 Booting your machine takes time, but so does shutting it down. Various issues contribute to a show shutdown. - Ask Leo! Booting your machine takes time, but so does shutting it down. Various issues contribute to a show shutdown. Where Do I Report Windows 10 Issues? - There are a couple of ways to report Windows 10 issues. One involves searching for an answer, and the other is a tool built into Windows 10 itself. How Do I Shut Down a Machine with No Display? - It's not difficult to shut down a machine if you can't see its screen -- as long as you plan ahead. « Previous post: I’ll review the basic components of a home network and some steps to take as your network grows.